band, Events, Perth, Uncategorized, What's hot. There’s nothing like spending your hump day listening to live music, and that’s exactly what a small portion of Perth got to do last night. Iconic Australian electric music duo, The Presets came to Metropolis Fremantle last night to promote their latest album “Hi Viz”. Arriving at the venue there was a mix of faces, young and old, but all with looks of eager anticipation to see the Aussie legends. The night started with opening acts Kult Kyss and Roland Tings, playing similar music to one another, but both seemed to get the crowd excited for the exciting night that was yet to come. As far as crowd interaction goes The Presets were successful in keeping the high energy going with Hamilton talking to the crowd and Moyes dancing across the stage in sync with the bass drops and continued to hype up the crowd the entire night. The crowd pleasers managed to unite the crowd, mixed with old fans and new with their music from their debut album to their latest, Hi Viz. “Getdown Shutdown” was a fan favourite, from the newly released album, as the mosh seemed to enjoy a little too much as there were people sitting on shoulders and excited screams echoed throughout the building, almost resembling a festival mosh pit, but most certainly mirroring a festival atmosphere. Wait a lot of conversations took place in 1962, let’s be a little more specific: On the Universal Studios lot in Hollywood, California in the office of Sir Alfred Joseph Hitchcock with French Director François Truffaut a conversation took place. Over 8 days Truffaut, with the help of an interpreter, questioned Hitchcock about his movies and his process of directing them, Truffaut would later turn what was taken from these conversations in to a book called Hitchcock/Truffaut that would be released in 1966 by Éditions Robert Laffont and become a bible of sorts to many filmmakers. The most exciting thing for most this weekend is that Oz Comic Con has finally arrived! Friday the 1st was for the media only, but fans can buy weekend passes or one dayers starting Saturday at 9am. If you missed out today, don’t worry — Sunday’s going from 9am to 5pm. You can meet actors from all your favourites like Supernatural, Teen Wolf, and Star Trek. Xena The Warrior Princess is here too! If that’s not your thing, local football team Fremantle Dockers are playing their match at Domain Stadium today. They’ll be against the Gold Coast Suns, starting at 4:40pm. Sadly, the game won’t be broadcast on any Channel 7 for those who can’t make it. Ben & Jerry’s Open Air Cinemas is still going on, too! Located at the Ozone Reserve on Riverside Drive, corner of Adelaide Terrace, it’s set to provide enticing snacks, cold bevvies and surround sound film in high definition. For more details, head to the website and click on Perth at the bottom. Now if none of that entices you but you still want to go out, you can check the long list of awesome activities Perth has to offer at the Perth City website. That… or you could put on Boom and make your own fun at home; the world is your oyster! Perth is busy with construction everywhere – it seems like – but it’s all for the good of the future (although the roadworks in the city seem never-ending). All the new things being built and redeveloped and refurbished are in an effort to update Perth’s infrastructure to deal with the huuuuge population growth we’re going to get (well, that’s what the projections say). It’s also to attract tourism. We’ll have 2 million more neighbours by 2020! 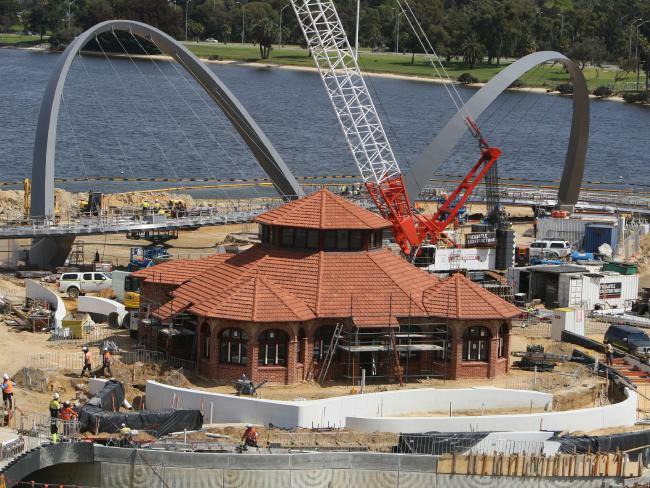 Firstly, there’s the $440 million Elizabeth Quay project down on the foreshore of the CBD. It’s going to have a nice cafe strip, some whacky modern art sculptures, a cool walkbridge over the river and… It’s just going to look pretty. (It will, trust us… we think…) Just 9 weeks until it’s done! If you’ve ever been to the airport (either of them) you’ll know about the roadworks. 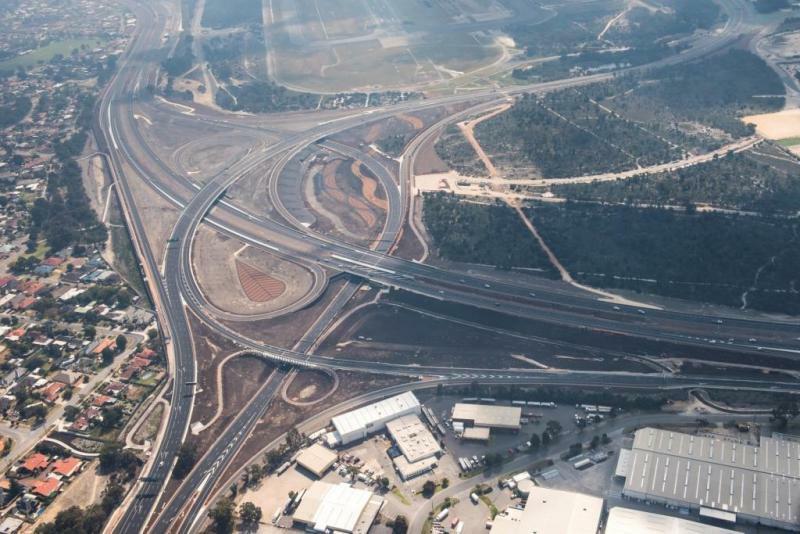 You may have seen that they’ve opened up a new interchange between Leach and Tonkin Highway; now you can drive straight into Terminals 1 and 2. You can even get from those terminals over to 3 and 4 via Tonkin Highway – super easy is you took the wrong exit and need the other terminal! Perth Airport in the future. It won’t really be all QANTAS though. The airport itself? Well, that’s going through a MAJOR upgrade, again to cope with the estimated population growth and the amount of passengers flying in/out of Perth. Right now about 13 million passengers fly every year but the new facilities will be able to handle 40 million+. Go Perth! You’ll be able to get to all terminals from the one building. It will take 30 years for it to be completely done and dusted but hey… Wait Awhile, right? 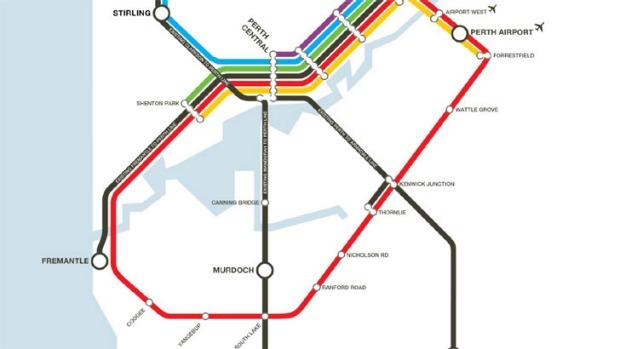 2020’s Train map, bringing the Eastern suburbs the railway. Getting to the airport can be a pain (of course if you don’t fly or have never flown before none of this would be of any use). Fear not, dear neighbours, for the train line will FINALLY be extended to the airport. The Forrestfield-Aiport Link Project will link up a bunch of the eastern suburbs to each other and to the city for your convenience. The 8km underground stretch of track will spur off the Midland line just after Bayswater Station and have you at the airport in no time. Just go up the escalators from the underground and you’ll be all good to check in to leave WA forever. Or not. 2020 is when the first train leaves the station! There was talk of cable cars in Perth, but do we really think that’s going to happen? Perth probably won’t get something that cool. A light-rail, which has been thought about, is probably going to be built but the government just can’t decide when to do it or where to put it. Here’s to an ever-changing city! Maybe one day – just one day – we’ll be able to say, “There was no traffic at all on the way there, I got to the airport on the train in 20 minutes!” Here’s hoping. Just really quick, Boom’s ever-changing too! Keep checking our Shows page to keep updated on who and what’s on air! 1. Where will you be from Friday to Sunday? The Skills West Expo is the only place to be this weekend with great chances to find out what you want to be doing in the future and also to meet the Boom Crew live on location at the Skills West Expo. 2. Where will the Boom Crew be at Skills West? 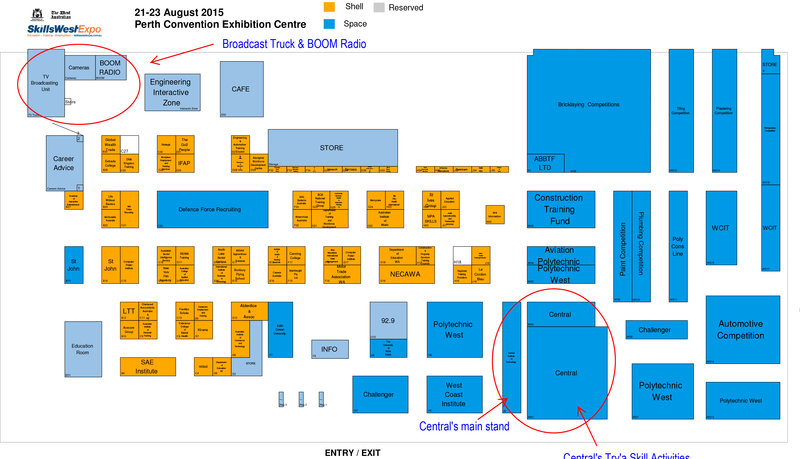 We’ve also got that covered, here’s a handy map to show you where we will be all weekend broadcasting Boom Radio live from the show floor. Make sure to come on down to see us and even maybe find a future career at the Skills West Expo at the Perth Exhibition Centre from the 21st to the 23rd this week.